We are here with some of fascinating insights about the world’s most famous precious metal GOLD. 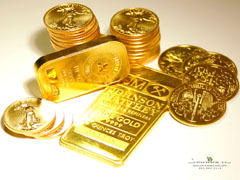 You will be amazed to know that total 167,000 tonnes gold is already mined all over the world till 2012. This quantity of gold would fill about 120 standard – sized shipping containers. This means altogether this gold would weigh 16.5 times more than the Eiffel Tower. However the world’s largest supertanker could carry more than 3 times that weight. Current market value of all gold is US $8 trillion, the current market value of all world’s available gold in US one dollar bills would fill about 18 of the world’s largest supertankers. This total value of gold is equal to about half of the public debt of USA. (Approximate US $15 trillion in 2011). If we consider gold leaf of 100 nanometres thick, 1/1000 of sheet of paper than with all available world’s gold you could cover a surface area the size of Switzerland with gold leaf. That’s about 2 times size of New Jersey. With 60 tonnes of gold , you could make gold wire long enough to stretch from Earth to the Sun. If we find out annual gold consumption than every year in jewellery we consume 1960 ton of gold equals to about 26 million gold watches. Every year our gold consumption in terms of investment is 1640 ton equals to about 50 million gold coins. We also consume gold in terms of technology which is 460 ton. 10% of this gold is used in dental applications. That’s about 25 million gold dental crowns and fillings. For more useful content please don’t forget to subscribe to the RSS-feed. Do like us on Facebook! If you enjoyed the reading this article we humbly ask you to comment, and help us to spread the word!